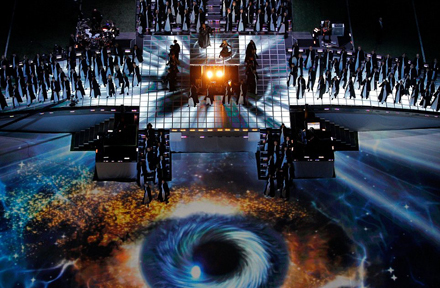 Madonna’s 2012 Super Bowl Halftime Show… Where to begin? 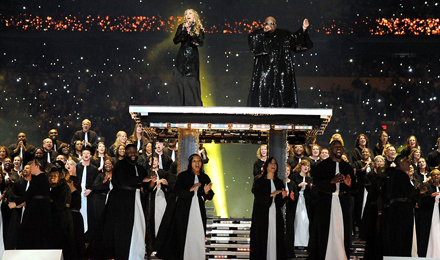 I mean ‘the greatest show on earth, during the greatest show on Earth’ was full of ‘star’ perfomances: Nicki Minaj acting like Nicki Minaj, LMFAO doing not much at all, some guy on a tight rope seemingly breaking all laws of physics and Cee-Lo in a sparkly black robe essentially was the centre of the show. 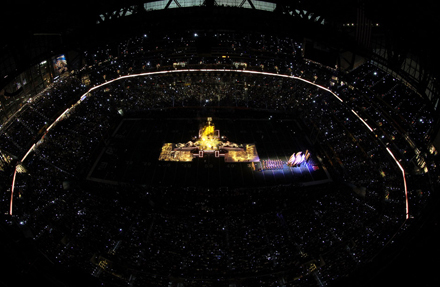 Well, I can say that Madonna is pretty smart for idea to perform in Indianapolis, marking her debut on football’s most-watched television event. 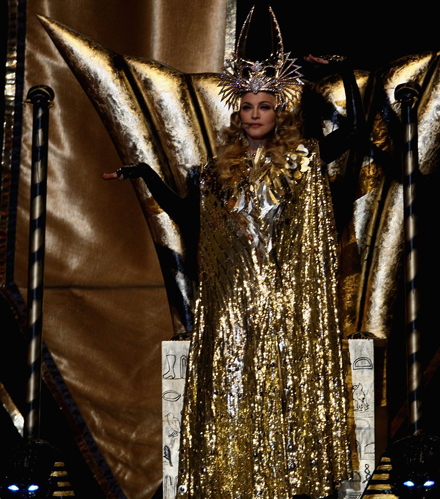 Madonna is Madonna and entered the stage on a golden chariot that was pulled by an army of Greek warriors. 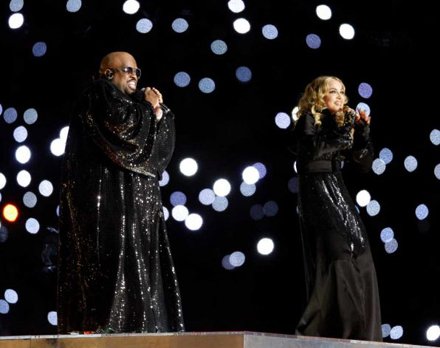 Madge began the show with Vogue, donning a black minidress, gold headdress and tall black boots, leading a dance routine to her ’80s classic. Next up was her 2000 hit Music, wherein she writhed around and tripped on some bleachers as the goofballs from the electro-pop group LMFAO deejayed in the backgound. 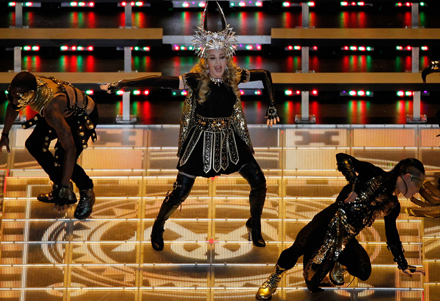 Give Me All Your Luvin, the latest single from Madonna’s new album MDNA, which drops March 26 was sung next. Nicki Minaj and M.I.A. 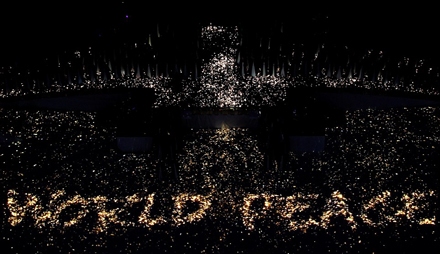 were repeating in unison ‘Madonna! 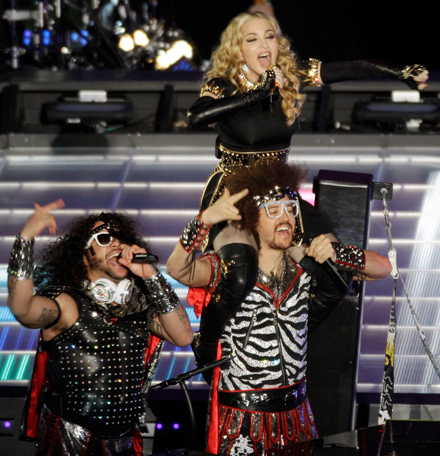 Madonna!’ while Madge was performing. Why? No idea. 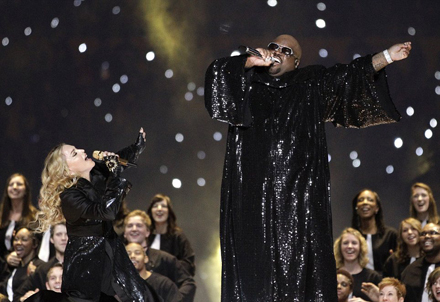 Cee Lo Green, a judge on the popular NBC singing contest The Voice, premiering its second season after the game, also happened to swing by, lending his soulful vocals to another Madonna standard, Like a Prayer. 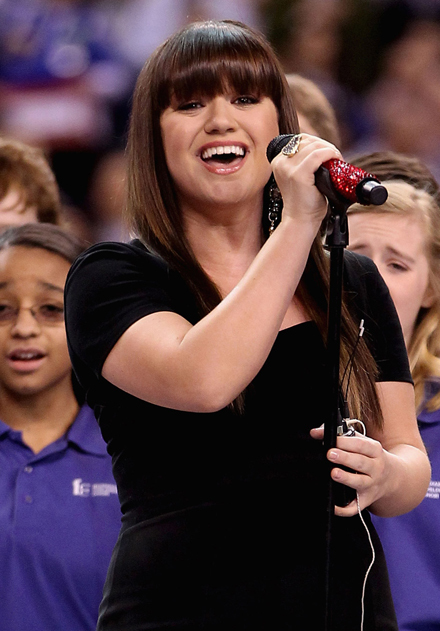 By that time, she had quickly changed into a long black gown to join Green and a choir for the gospel-tinged song, an audience favorite. Then, just like a mystery!, she disappeared underground in a plume of smoke, with the camera panning to the words World Peace scrawled in gold on the field. I was, eww, underwhelmed. I think that her supporting cast did almost all the stuffs while was walking around slowly and acting like she were 70, not 53. 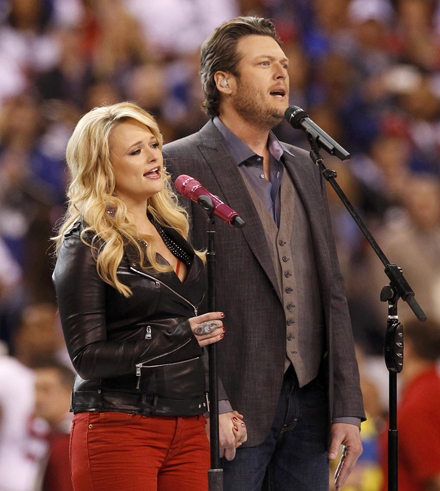 I guess that most of what she did were quick-changes of outfits. Actually, I was bored after about a minute and a half and logged out. I asked my friend if there was anything that’s worth seeing. What do you think the answer was? No! 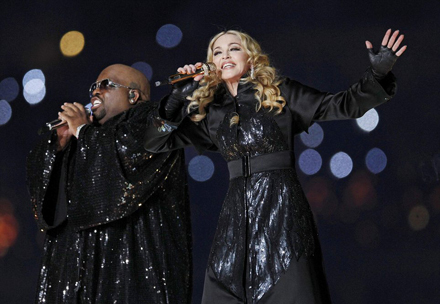 Who does Madonna think she’s performing for? Even my granny didn’t like her ‘super-dooper’ show. How sad… Do you agree that they were all just sucking-up.